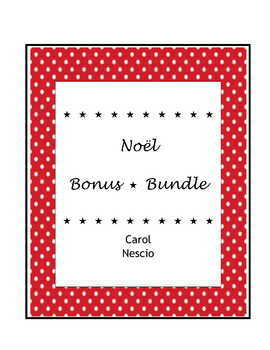 Here are several interesting, fun, hands-on activities to introduce French Christmas words and customs to your class. Each item can, of course, be bought separately. Just click on the title for complete descriptions and individual prices. If you like my products, please follow me by clicking on the little star at the top under my name. Merci. . . Look for the brown polka dot cover . .
.. Available to any other French teacher, too. Quite a savings with over 400 pages. ..
* The Use of tu * vous In French .. It's free. ..
* Tissue * Box Project For French Class .. A great back-to-school review project. ..
* The Color * Game For French Class .. Attention ! This can get pretty exciting ! ..
* Menu * Project For French Class.. Great back-to-school activity for level 2. This makes a nice bulletin board or hall display of student work for Open House night. ..
* Wordle Activity * Pac For French .. Be prepared for Excitement with a capital E ! ..
Customs & Life in France* Wedding * Customs In France .. Nice to talk about a few days before La St.-Valentin. ..
.. Nice for La Toussaint. ..
.. Perfect for La Fête des Mères en mai. ..
* Final * Exam For French 1* Loto * Pac For French .. Review more than just numbers with this fun way to reinforce vocabulary, too. 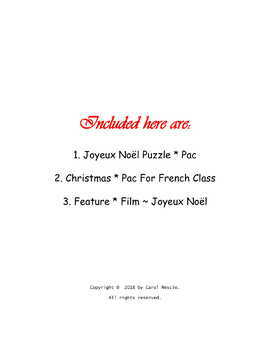 ..
* Crossword Puzzle * Pac For French .. Perfect homework assignment to reinforce new vocabulary. ..
* Battleship * Pac For French .. Good oral practice of verb tenses. ..
* Country Map * Project For French Class.. Easy for French 1 and makes a nice bulletin board or hall display of student work. ..
* Word Wise Vocab * Pac For French .. Nice for expanding the vocabulary of your AP French students. ..
.. Nice for after the AP French Exam or for upper level students. ..
* Feature * Film ~ Les Misérables .. You'll be on the edge of your seat till the very end. ..
* Feature * Film ~ Vitus .. Good way to touch upon a different language area of Switzerland. ..
* The Traveler's * Ten Commandments For FL Students .. It's free. ..
* Valentine's Day ♥ Trivia Game For French, German, Italian, Spanish.. Perfect fun activity in February for your French Club. ..
* Eponym Activity For French, German, Italian, Spanish .. Works well as a sub plan, too. ..
purchases each time you give a comment on a product you have purchased ? rating & make a short comment so you receive a TpT credit.